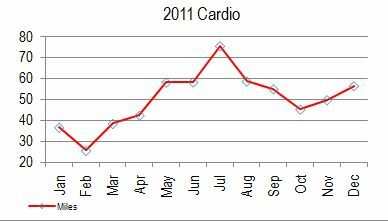 I did about 600 miles of cardio in 2011 (either running or brisk walking). This comes out to an average of 1.65 miles a day. My 2010 average was 1.22 miles a day, so in 2011 I increased by 0.43 miles -- or 35% -- over 2010. Pretty pleased about this! I also layered in more strength training, which was part of the plan. Of course, there's plenty of room to step it up in 2012 :-) My goal is to shoot for a 22% increase over 2011, which should land me pretty close to an even 2 miles a day on average. This sounds lofty to me right now, but isn't that part of the point in goal setting?